I am excited to provide you with my first email update as your senator-elect for the 28th Senatorial District. Communication is key. It is why each week, I will send out email updates to the residents of the 28th Senatorial District. I want to keep you well-informed about issues and events that are important to you. These weekly emails will have information pertaining to local news as well as my votes and legislative efforts at the state Capitol. While I do not take the official oath of office until January 1, we have been working diligently to ensure my staff and I can serve you. This week we had computers installed at the district office in Jacobus and I expect phones will be installed next week. I also have an online office, which I encourage you to visit. You can find that at www.SenatorKristin.com. Please take a moment and watch my welcome message for my website here. If you would like assistance on any state-related matter, please fill out this form so we can best serve you. You can see all services provided by my office here. I will continue to provide you with updates when my staff and I will hold mobile office hours throughout the 28th District, which spans from Paradise Township to Peach Bottom Township, from Wrightsville to New Freedom. If you have any suggestions, questions or concerns, please contact me. You can also find me on popular social networking sites, including Facebook, Twitter, Instagram and YouTube. I look forward to serving you and being your voice at your state Capitol. I can best do that with your input and guidance. 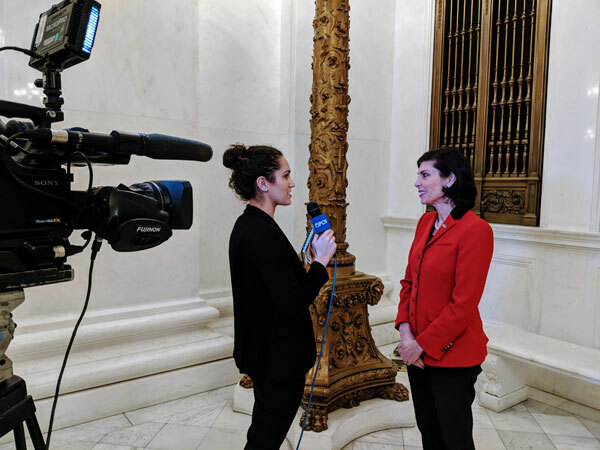 Earlier this week, I met with the Pennsylvania Cable Network’s Kes Baker to outline some of my top priorities in the state Senate. The interview will air on January 1 and will also be online at www.pcntv.org. While there are a lot of issues we need to tackle at the state level, I am alarmed by a recent report from the Independent Fiscal Office that projects a budget deficit of $1.7 billion for our next fiscal year, which starts July 1, 2019. In addition to reining in government spending, I will continue to fight to cut bureaucratic red tape through comprehensive regulation reform in Pennsylvania. In fact, I circulated a memo in the Senate outlining my plans to introduce a measure in the New Year to overhaul our state’s regulatory process. The state recently offered Amazon nearly $200,000 per job to locate their second headquarters in Pennsylvania. If we had a more business friendly state, we would not need to offer taxpayer-subsidized incentives to multi-billion dollar companies. Watch my remarks on this priority here. A report issued earlier this week by Penn State University and the Center for Rural Pennsylvania indicated that 11 million Pennsylvanians are without access to high-speed internet, up from 800,000 that was originally estimated by the Federal Communications Commission (FCC). As the lone representative from Pennsylvania on the FCC’s Intergovernmental Advisory Committee, I will continue to strongly support a coordinated effort to bring high-speed internet to all Pennsylvanians. Agriculture, health care and our economy rely heavily on high-speed internet. People throughout the county need it now more than ever. I will continue to fight for solutions to ensure everyone – regardless of their zip code – have access to quality internet. These are just a few of the many issues I intend to work on in my first few months as your state senator. If you have legislative suggestions, please let me know. On Thursday, I attended a ceremony recognizing the hard work of 35 “Shining Star” teachers. Thank you to the School District of the City of York for inviting me to join the celebration of the district’s Shining Star teachers and the achievement of the students in each of their classrooms. Congratulations and thank you to those teachers! Our children’s success today in the classroom is our community’s success tomorrow. We are grateful for your efforts to inspire our students to aim high and achieve. Watch this highlight video of the event courtesy of the York Daily Record. Today we honor and remember the 2,403 American lives lost in the attack on Pearl Harbor. Earlier this week we lost a great American in President George H.W. Bush. Our nation is in a much better place because of the honorable and humble lifetime of service that President Bush dedicated to the United States. Tributes have poured out throughout the country. One of the most moving tributes was President George W. Bush’s eulogy at his father’s funeral in Washington D.C. If you have not seen it, please check it out here. Rest in peace, Mr. President. Thank you for dedicating your life to the betterment of the United States of America. 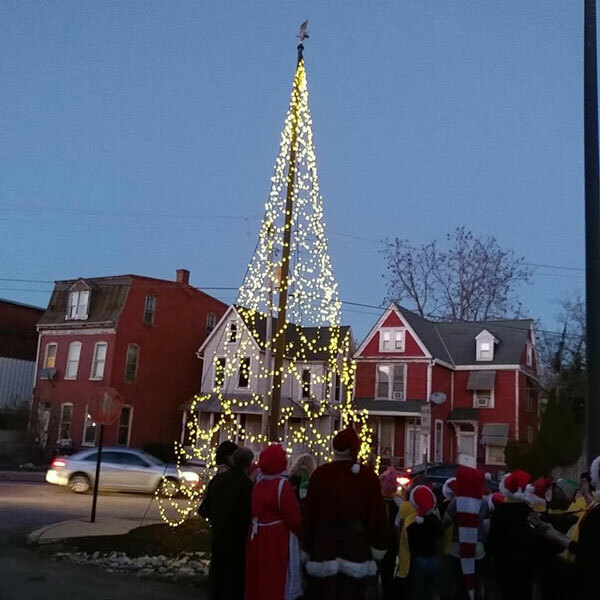 The York County Economic Alliance (YCEA) hosted their “Lighting up the Lot” event at their office on Roosevelt Avenue in York. 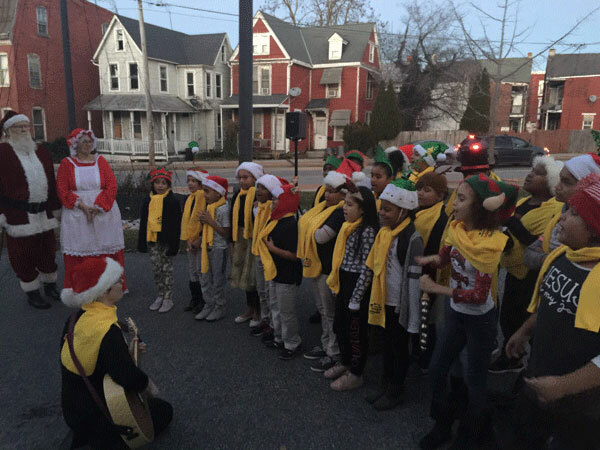 Children from Lincoln Charter did an excellent job at getting the community in the holiday spirit. This was a wonderful event for people of all ages to celebrate the holiday season. 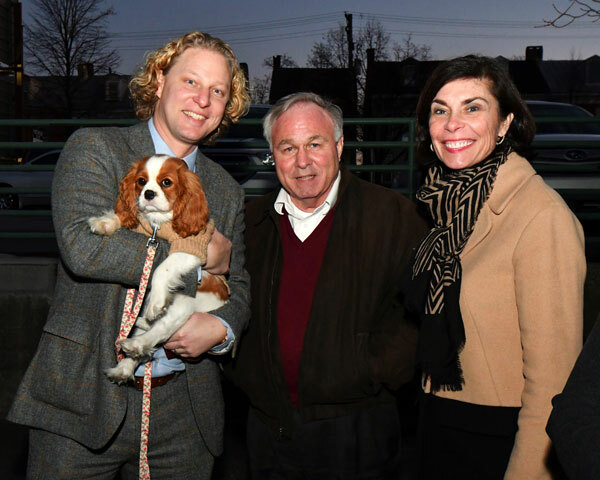 Here I am pictured with Kevin Schreiber, YCEA President & CEO, his new puppy, Penny, and York County Commissioner Doug Hoke. On Thursday I participated in the York Area Metropolitan Planning Organization’s (YAMPO) meeting about ongoing efforts to improve our county’s roads and bridges. One of the key topics of the meeting was widening and improving I-83. A report found it would cost $280 million to widen the interstate through parts of York County. The York Dispatch covered the meeting, which you can read about here. You can find out more about YAMPO’s meetings here. 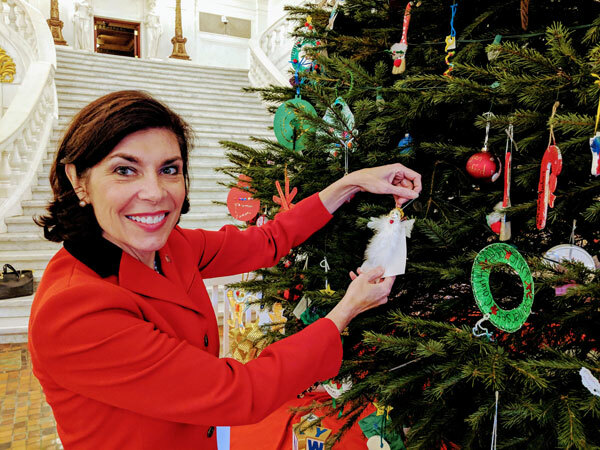 In between various meetings at the Capitol on Monday, I placed an ornament that was provided to me by the South Central York County Senior Center in New Freedom on the 18-foot Douglas fir on display in the Main Rotunda. The ornament was a great addition to the beautiful Christmas tree from Carbon County. 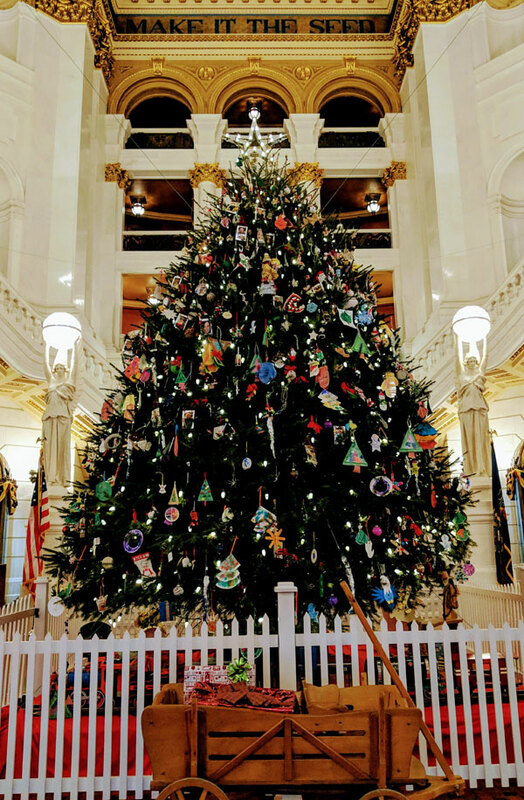 The tree was officially lit on Thursday at noon, with a ceremony hosted by Governor Wolf. The Pennsylvania Department of Banking encourages vigilance when using automatic teller machines and gas pump card readers. Illegal card readers attached to payment terminals capture the data from the card’s magnetic stripe or computer chip, leaving no trace of the theft until the victim’s information is used to make purchases. Immediately contact the PA State Police at 717-783-5599 or your local State Police barracks to report the theft of your personal financial and account information through card skimming. Due to a law I wrote as a state representative, a first time conviction for possession, sale and use of a skimming device is a felony of the third degree, including a fine of up to $15,000 and up to 7 years in prison. Second and subsequent offenses result in a second degree felony with a fine up to $25,000 and up to 10 years in prison. Motorists are being encouraged by the Pennsylvania Department of Transportation to be prepared when traveling. Ensure you and your vehicle are winter-ready in case of an emergency that could potentially delay your travel plans for several hours. After your vehicle is winter-ready, don’t forget items to increase your comfort in case of a travel delay. PennDOT recommends packing an emergency travel kit, including any special needs such as medication, baby products, or pet food.